KUM is a four-stage mountain race leading from Szczawnica to Wisła in southern Poland. It is easy to guess that new trail running events are often underrated and don’t get all the attention they deserve. It is especially true for the first edition of each event. The quest for such unheard-of races that have great potential is extremely interesting. It is the opportunity to try something special, off the beaten track and definitely not lying on the map of world’s most popular races. The organizers have very meticulously planned the logistics and the formula of the run. 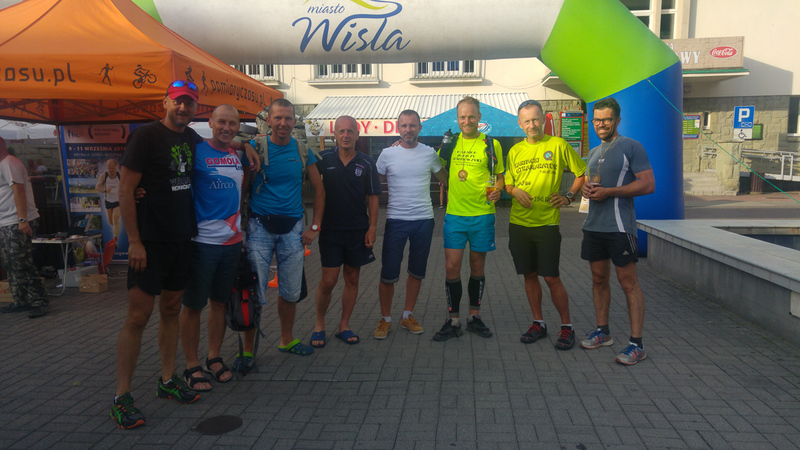 Upon arrival to Wisła we leave my van and take the minibus provided by the organizer that will take us from the finish line to the very beginning of the race. Thanks to this trick, after four days of traversing the mountains we will reach Wisła again. On the way to Szczawnica (the start line) a cheerful and talkative driver shows us some extra attractions along the way. 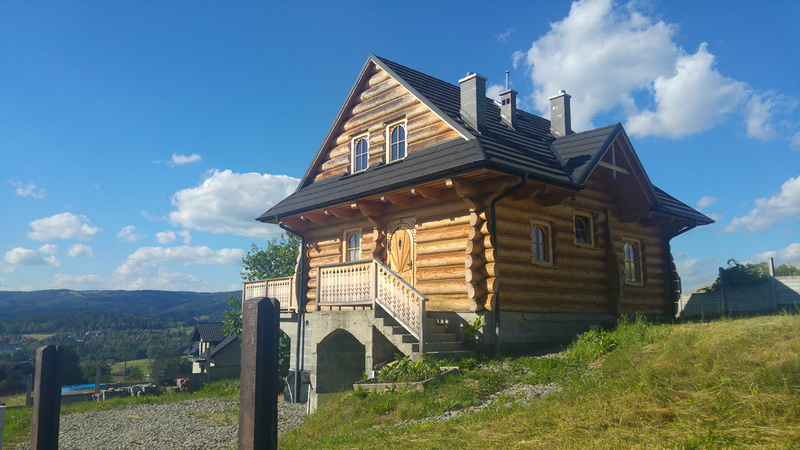 Here is Adam Małysz house (Adam Małysz is quite popular and retired local ski jumper). Here is his museum and over there is the primary school that Adam Małysz went to. Behind that hill is his family home and the place where he grew up. We pass through the vast openness of highland Podhale to admire a picturesque panorama of the Tatra Mountains. We also pass by Żywiec brewery (one of Poland’s biggest breweries). At some point the driver tells us a story about a curious chapel, which was built in the course of just one night to bypass the regulations on building permits at that day. Interesting. All these things we see in nearly 3 hours driving through the Carpathian wilderness. Even from the perspective of the car the distance scares me and I already know that it will not be easy to return to the Wisła. 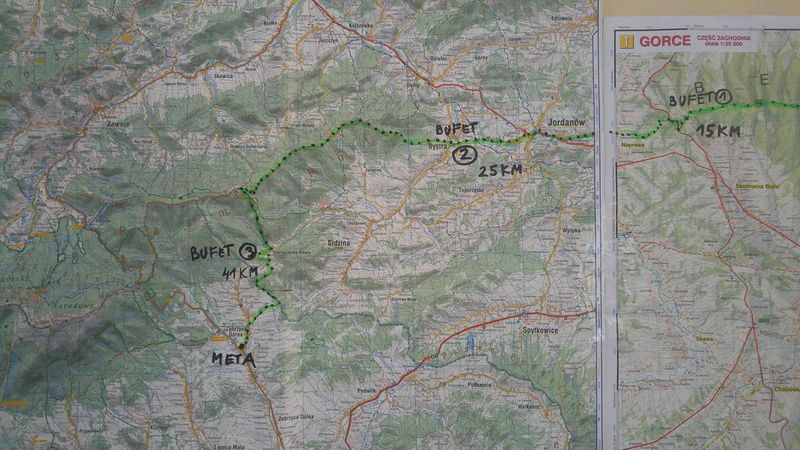 Especially keeping in mind that rather than following the same car route, we will have to go over the mountain ranges. There will be roughly 200 kilometers and close to 9000 meters of vertical gain to cover. We stay the first night in Szczawnica in a basic accommodation facilities provided by organizer. Every day we would get up at 6 in the morning. Start the day with some exercises awakening body and mind, eat hearty and rich breakfast and get to know the stage of the day during the daily morning briefing. Then it is to pack the luggage for the day and send it from the start to the finish line of the day’s stage. We start running every day punctually at 8 AM. 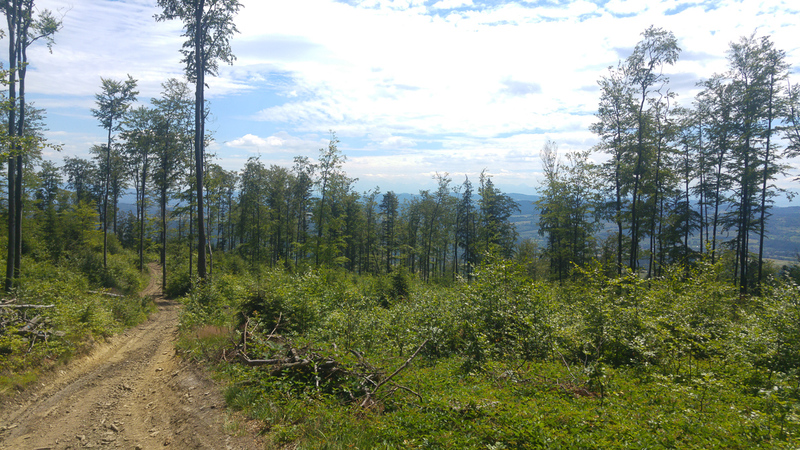 The first 7km is a strong ascent along a yellow trail that leads us from Szczawnica. There is a humid, cold air left after the chilly night. As we gain the altitude, the temperature drops further but we also warm up quickly. We run through Dzwonkówka and in Jaworzynka we change to the trail to a green one. 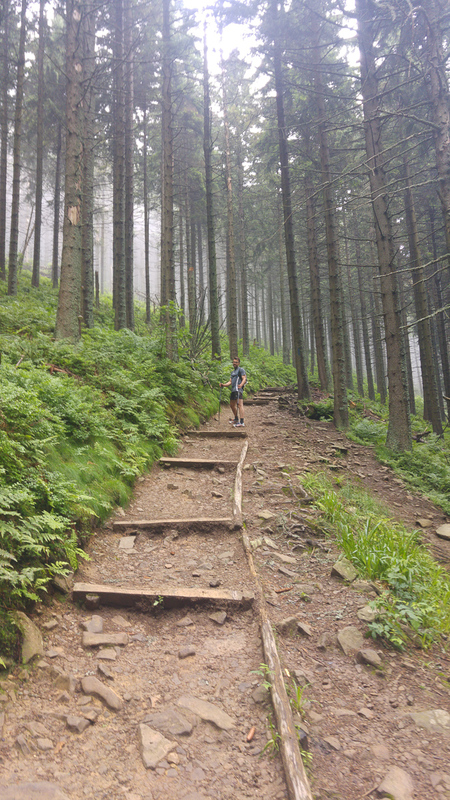 In Tymanowa we stop at the first nutrition point and just after it we start another steep ascent to Lubań. In about 1/3 of the day’s distance we already have made more than a half of the vertical gain planned for today. One might assume that the harder part is already finished, especially considering the steep ascents and descent on stone paths that require full body concentration. On the green trail there is also a lot of harsh vegetation, scrubs, ferns and other green stuff – as the color of the trail would suggest, it is really green. The second part of the day is a bit easier, but having fatigue in your legs it feels equally difficult to keep the pace as in the beginning of the day. We refill our supplies at the last buffet on Turbacz (at km 45) and then we are calmly approaching Stare Wichry i Maciejowa. Along the way there are is a lot of folklore and beautiful landscapes. There are shepherds looking after their sheep, goats and cows, as well as extensive fields being harvested. We are going to Rabka Zdrój, where dinner is waiting for us and we wash it down with delicious Czech beer in restaurant Retro. Stage one is finished. Result for the day: 63km / 2874m D+. According to the daily routine we start at 8am. In Rabka the weather is on our side, so I decide to run light, just like most people. We assume that it will not rain and that it will not be too cold on the route. For warming up a leg-work of 600-700 vertical meters to Luboń Wielki comes handy. 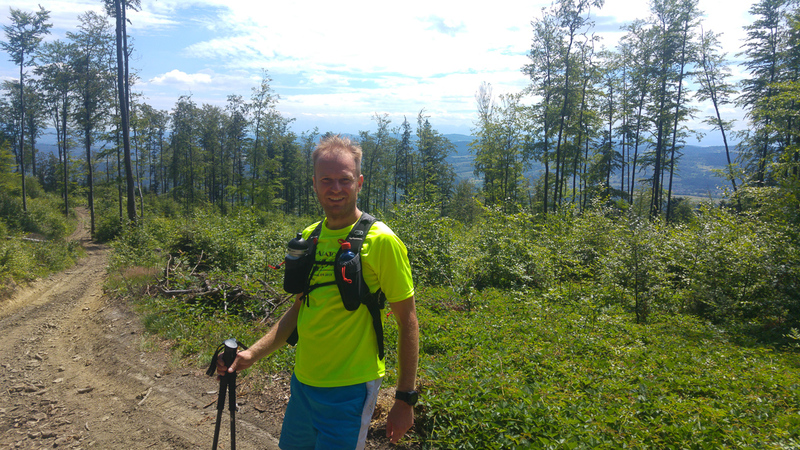 After a good start uphill, I start to lose some positions when the terrain flattens or even worse – it becomes downhill. Getting most out of my yesterday’s muscles is quite challenging. It is especially difficult to move along the stones on a steep path and control the speed without wasting too much energy on braking. We run through Jordanów. Even though it is a small town, it gives the impression of being in some kind of metropolis. That’s the feeling once you get out of the forest to civilization. I just get used to forests very quickly. 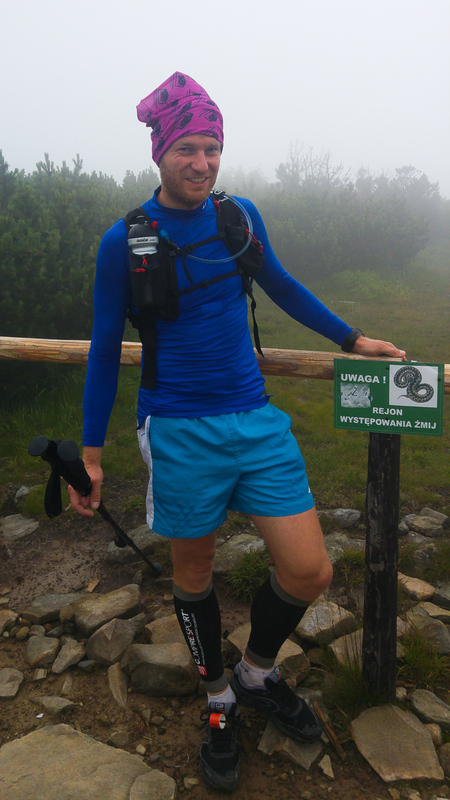 We arrive at the second feeding point in Bystra, where another strong ascent to Okrąglica via Hala Krupowa. And there comes a surprise! Someone probably must have taken down the marker tape and removed other signs pointing the right direction. Hasn’t it been for a GPS track and one key word “sharp turn” I remembered from the technical briefing in the morning, we would have been so completely lost! There is nearly no chance of spotting a sharp 180 degree turn at around 38th kilometer into the second stage. Today’s stage starts to resemble an orienteering race. I’m getting lost somewhere again, the route is supposed to take you along the marked trail, but sometimes it’s too easy to overlook overgrown passages and you can by mistake, for example, end up on the road for forest vehicles. Fortunately, with the help of some local woodcutters we find a little narrow path taking us to Zubrzyca Górna, the end of the stage. At the end there are some muddy parts, but in the end we reach the finish line. Another day and 51km / 1828m D+ accomplished. There was a storm at night. I’m glad it hurried and passed in the middle of the night. It was the storm everyone has been expecting during the day. There is still hope that we will be able to bypass some of the precipitation. 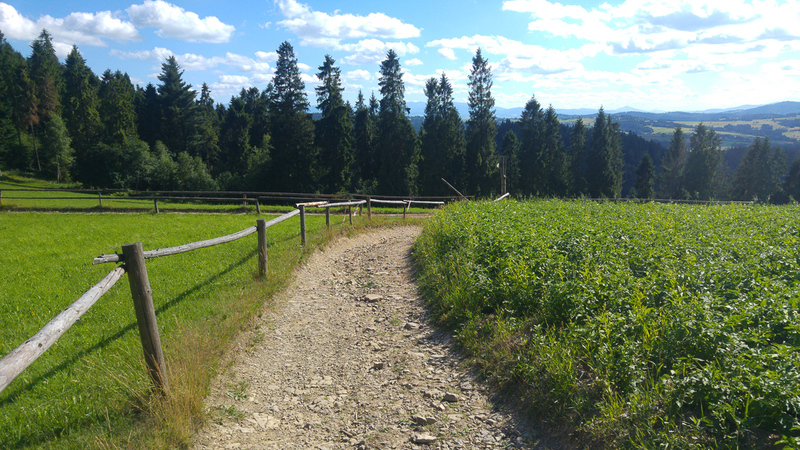 We run out of Zubrzyca Górna and make a loop around the area belonging to an open-air museum with historic wooden houses and agricultural tools (de facto, the whole group got a bit lost here by following a leader, so it’s a unplanned sight-seeing tour on the way). Thereupon we run through forest and field paths to Krowiarki. 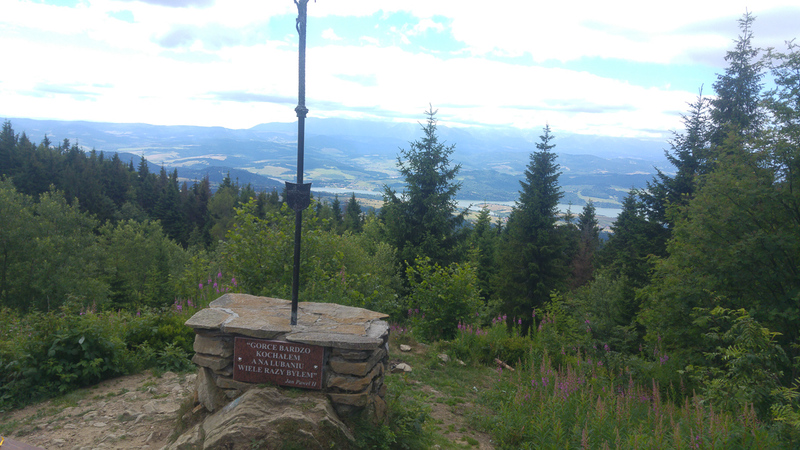 From here we are about to experience the highlight of the day: to run Babia Góra uphill. I have never been to Babia, but I’ve hear a lot about this mysterious place. This is a very special moment for me. We break through the thick mist leading us to the top through the magical spruce forest. As we gain the altitude, the thick spruce forest gradually becomes area sparsely populated with shrubs. It takes exactly one hour to reach the peak of Babia Góra. We experience strong, strikingly cold winds at the top. Mist and narrow stone paths with limited visibility add to the mystery to the course. The subsequent part of the route will take us along the Polish-Slovak border. Interesting is the fact the European watershed, or the drainage divide which separates the basins of the rivers that will ultimately empty on one of the sides of the mountain range. Depending on which side the rain falls, the water end up in the Baltic or the Black Sea. Of course, it’s true not only for the rain. After the traversing the massive of Bagia Góra, we climb to the top of Mała Babia Góra and we reach Przełęcz Jałowiecka Południowa and Jałowcowy Garb. It starts to rain and it gets muddy. I take easy the remaining part of the stage to save some energy for the final fourth day of KUM. At Westka we turn towards Korbielów. At this part you have to stay vigilant, because it the yellow trail is has many turns and is not difficult to be lost. Today’s distance is theoretically only 36km and 1864m of vertical gain, however, it was not an easy day. The body starts to require some rest after three intense days. Today’s big finale. We will start from Korbielów towards Wisła. The last chance – or even the necessity to use all the energy that is left. Having stayed at relatively low altitude, we have quite a intense uphill part to start with. It is roughly 500 vertical meters climbing to around 1300 m. The upgill part is usually a opportunity for me to get some good standing for a while before I start to lose my position on flat and downhill parts. I’m just made for running uphill, nor flat neither downhill. 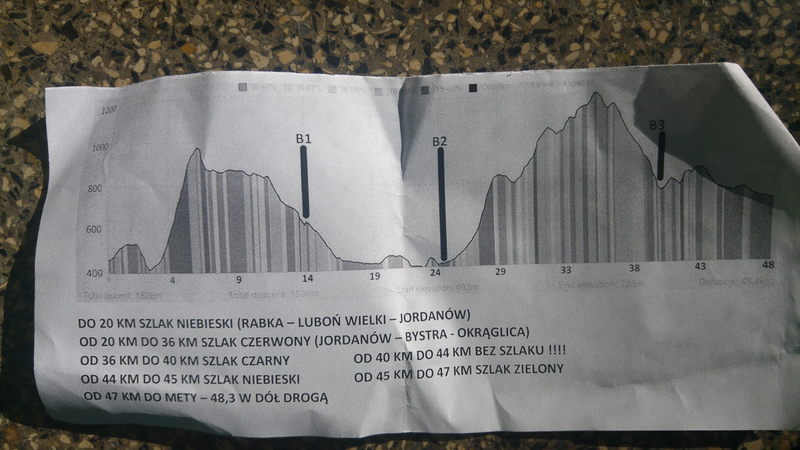 We just brifely touch he slope of Pilsko mountain (a popular one) and again run along the Polish-Slovak border. We often change the trail, but in general we move long the ridge. Gravel and rocky areas are predominant. It is a partially protected area. There are some small nature reserves. We run through Hala Miziowa, Palenica and Trzy Kopce. Then we continue west to Hala Rysianka. There’s a significant left turn that is easy to overlook. Then we go through the fields and gravel paths. The improvised part of the route begins. This is part where you can easily get lost! Obviously not the first time, but being lost now is a bit more special than usual. We are lost in Cisiec, a small village and for lack of the idea what to do next, we call KUM technical support. Rafal, one of the volunteers, quickly shows up and takes out of the trouble by showing us the right route. At this stage my left leg is already done for today and the swelling starts to look bad. If it had been just a casual run, I would rather withdraw. But it is the last 50 kilometers of KUM, the ultimate challenge. That’s why it is worth to go over the pain and make it to the end. We manage the wild part of the route by negotiating through the meadows to hit an elegant asphalt road among the woods. This takes us to the second food station. Another uphill part begins and the ground becomes pebbles and gravel. A kaleidoscope of mountain landscapes emerges in front of our eyes. It’s a wilderness area, we go over a dozen or so kilometers in almost complete isolation. We are going through the Barania Góra National Reserve and enter Magurka. We take a number of small steps along the way and descend. In this episode you can fully contemplate nature and enjoy the race, even absent-minded as it is impossible the get lost here. There is only one road. We reach Przełęcz Salmopolska. From there it is merely a downhill run towards Wisła through 3 Kopce Wiślańskie. In spite of being completely tired, there are yet unknown energy reserves coming to my muscles. I accelerate running through the city of Wisła towards the finish line. It’s time to use the very last of my strength. Todays distance: 60km / 2398m D+. We made it! 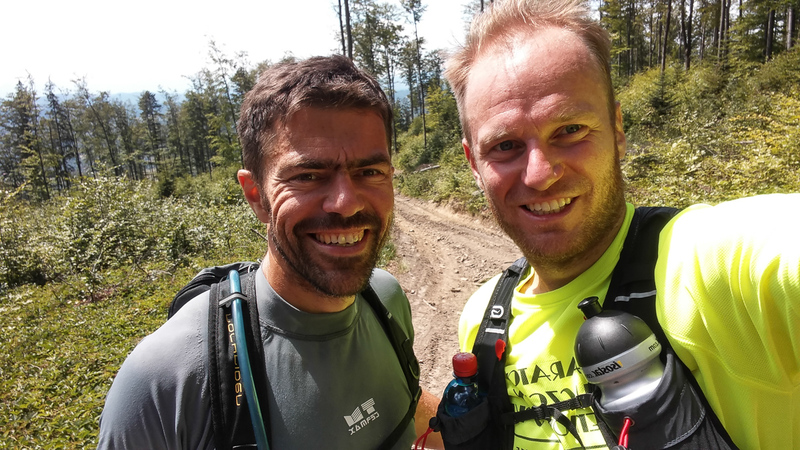 Satisfaction of finishing this four day race is even greater than I have imagined in times of crisis or alone in the endless mountainous terrain. The euphoria in the head and some instinctive thoughts arise: is it possible that it is the end? Can it all be already over? This is only the end of this edition. 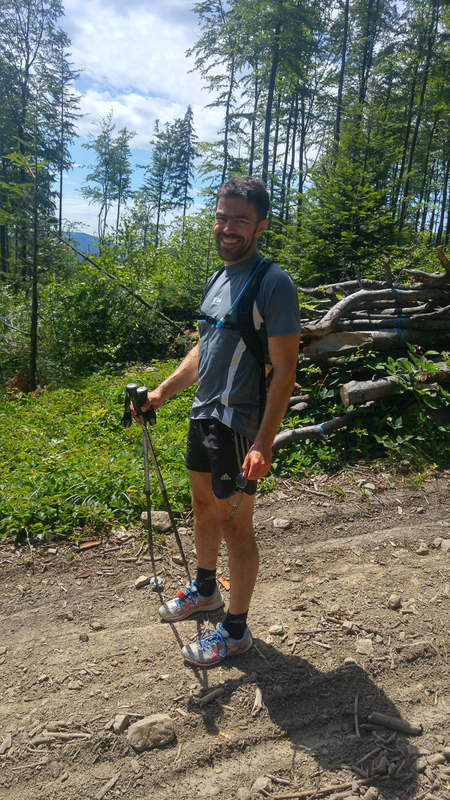 The fantastic memory of the whole KUM and thousands of snapshots from each stage of the course will definitely be with me as soon as I think about the magic of the Polish mountains. KUM is an adventure 100% worth recommending. Great greetings to the organizers and fellow participants for these unique 4 days full of impressions. The total distance, including about 3-6 km extra of being lost is according to my GPS watch about 208km and 8954m of vertical gain. And after the run… time for holiday! Our van is already packed and ready to start new adventure. This year’s holiday direction: southeast in general, with no details. We will see where the road takes us and what will happen. We leave Poland, then go through Slovakia and pass the nature reserve in Hungary. There are foxes, roe deer, hedgehogs and weasels on the way after dusk. Only wolves and bears are missing, but supposedly these are also possible to be found here. 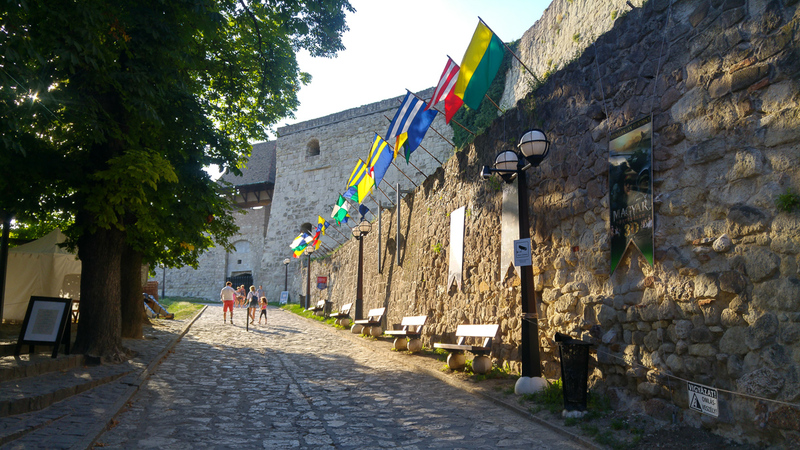 It is getting late so we go to sleep upon reaching Eger, the town I have never heard of which before. In the morning it turns out to be one of the most popular tourist destinations in Hungary. My left leg is getting worse. Looks like the distance of 208km has not entirely gone smoothly or injure-free. Locals have some ideas. Believing in the unique renewable power of thermal waters we go to the healing pools. These pools are what makes Eger so famous. This is a bit like a combination of seaside resort and amusement park. Pools do not help, and my leg start to be more and more swollen. It’s already the third day after the competition and it is getting worse, so the only reasonable thing to do is to visit the hospital. The x-ray discovers that the leg is not broken. The doctor simply said “too much running”. I mentioned that I’ve been running a bit more than usual but I have not mention anything about 200km. He just advised me to rest, use some ice-packs (or cold river) for cooling the leg down, take a daily dose of some medicine against swelling and.. to be patient. Unfortunately, for the next two weeks everything will be a little more difficult. Without running, jumping and other excesses. 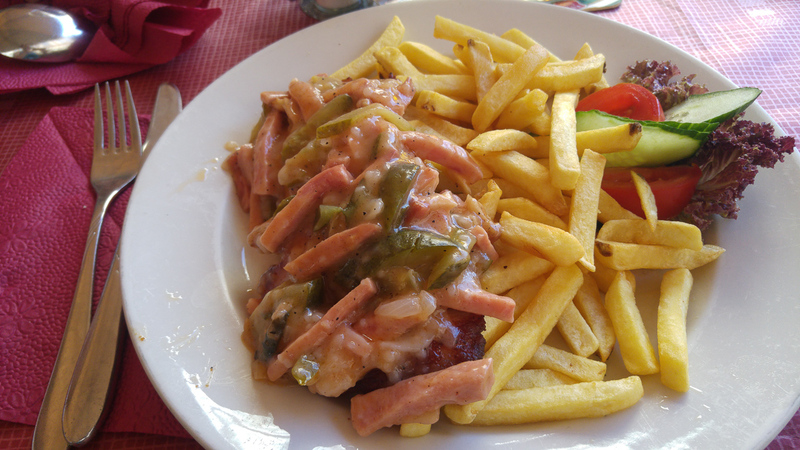 We visit the city, the citadel, we also try Hungarian cuisine. Then we move on.